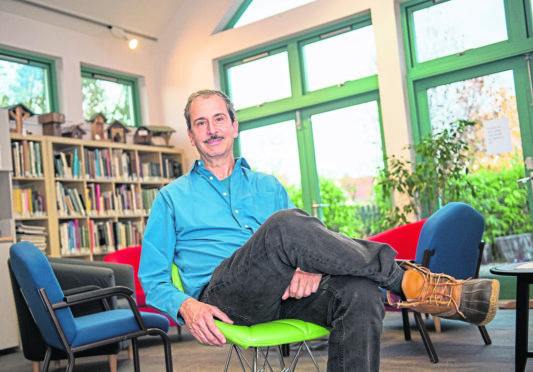 Randy Klinger (Founder of Moray Arts Centre) is pictured inside Moray Arts Centre, Findhorn, Moray. Picture by Jason Hedges. Moray Art Centre is the only visual arts centre of its type in the region and serves artists both local and from further afield. The venue in Findhorn offers four artists’ studios, three gallery spaces used for exhibiting a variety of artwork, three large creative spaces and a surrounding garden with it’s own built-in pizza oven for outdoor activities and events. Now, the board of directors at the centre are looking to raise £12,000 to make internal and external structural repairs to a building that is now over a decade old and showing a little of that ageing. Bill Austin, chairman of the board, believes that the popular community creative space needs sprucing up in order to attract more visitors. He said: “We want to refurbish the property as we have been in it for 11 years and it has became a little scabby in some areas. “It will be expensive to refurbish because there is substantial structural work that needs done and a new lighting system needs to be installed. A new LED lighting system to replace the out-of-date one currently being used in the classrooms and galleries at the centre is just one of the improvements the money will go towards carrying out. The Moray Art Centre suffered a financial disaster earlier on this year when they were given three months to find £60,000 in order to stay open. However, its financial fortunes improved after the art centre recorded its first monthly profit in several years and appointed three new directors to help improve its cash flow. Mr Austin says that the increased footfall the centre has had over the last year has helped with their money situation. He said: “We did have a financial crisis earlier this year but we now have no immediate threat to our existence. To donate to the crowdfunding effort, visit www.startsomegood.com/morayartcentre.